APPEARANCE: Datsueba and Keneō are a terrifying pair of elderly oni. They guard the bridge and the banks of the Sanzu River. All souls must pass by them before moving on to Meido to be judged. INTERACTION: During a Japanese funeral, 6 mon (and old form of currency) are placed in the coffin to be used as a toll to enter the underworld. Upon reaching the Sanzu River, the souls must cross either by bridge (if they were good in life), by wading in the shallows (if they were only somewhat good), or by swimming across the deepest part of the river (if they were wicked). 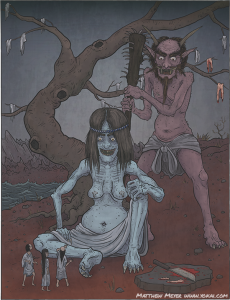 After crossing the river, each soul encounters Datsueba, who accepts the toll and strips the souls of the clothes on their backs. Datsueba hands the clothing to her partner, Keneō, who hangs it from a tree by the riverside. The amount that the branch bends under the weight of the clothes serves as a measure of the weight of the sin each soul carries, and is used as evidence in the trials to come. Of course, the clothes of those who had to ford the river or swim across are heavy and wet, which only makes the branches of the tree sag lower. If a soul arrives with no clothes, Keneō flays his or her skin and hangs it from the tree instead. Datsueba and Keneō perform a little bit of torture themselves, breaking the fingers of those guilty of theft, and so on. They also roam the banks of the river, tormenting the souls of children who are too young to cross the river and must wait for salvation to come to them instead. According to some accounts, Datsueba is the wife of King Enma. In the Edo period, she became a popular object of folk worship, and temples dedicated to her began to spring up around Japan. Prayers and charms dedicated to Datsueba were used as wards against disease and coughs, in particular for children’s coughs.